When I stopped driving the Barracuda because of burned valves, I knew that the brake master cylinder was leaking. When I got the engine and transmission overhauled and reinstalled twenty years later, I also installed a new (rebuilt) master cylinder. However, by then all the wheel cylinders were corroded and only one piston on the left front would break loose under brake pressure. 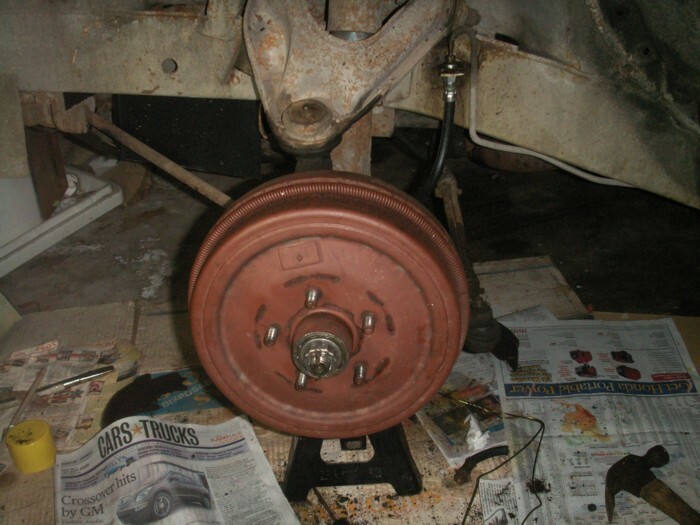 I started the brake job with replacement of the rear wheel cylinders. I took the return springs loose and separated the shoes enough to get the old cylinders off and the new ones on. It was a bad sign when I took the lines loose and no fluid came out. At least the flare nuts came loose without twisting off the ends of the lines. O.K. I got them all back together and still had no brakes. I picked up the job later with the right front wheel. That flare nut was very difficult to break loose, but I final got it with Vice-Grip pliers and a hammer. It didn't even damage it too much. And there was good clear flow of brake fluid from the open line. I had even bought replacement hard-lines just in case the hard-lines were clogged with rust. 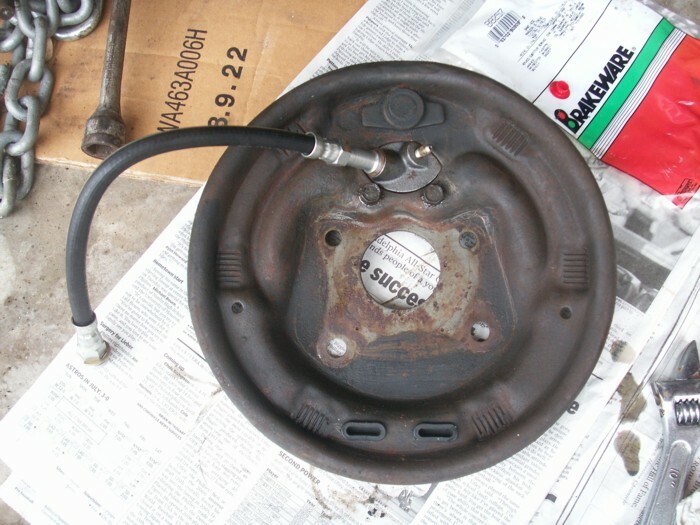 The brake drum is original. 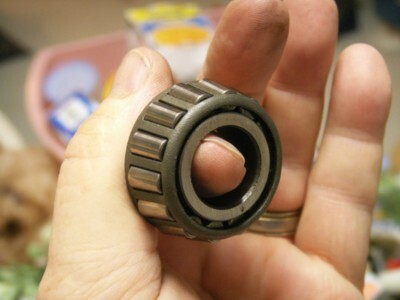 I removed the bearings and cleaned them and cleaned the old grease out of the hub. 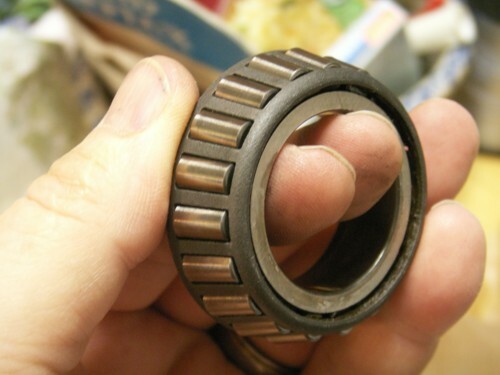 I noticed a gray spot on an outer bearing race and some other scuffing so I replaced the bearings while I was at it. With a new wheel cylinder, hose, and shoes the right wheel brake was as good as new. All the other parts are original. I soon got to the left front wheel with the same good results. Most of these photos are from that side. Then my son-in-law came over and helped me replace the rear brake hose. That's what was plugged and preventing fluid flow to the cylinders. I bled all the cylinders again, adjusted the brakes and they worked great. However, during the time I was working on the wheels, the master cylinder developed a bunch of rust in the reservoir, so I replaced it. Then that one developed a leak around the plug where the old hydraulic brake light switch used to go and I had to replace it. I got a new (not rebuilt) master cylinder from O'Reilly's. It was complete with everything including the brake pedal rod. I'm still using the original cap though. The brakes have worked well for about 7,000 miles now. I had no brake problems on my 5,800 mile round trip to Chicago, L.A. and back home. 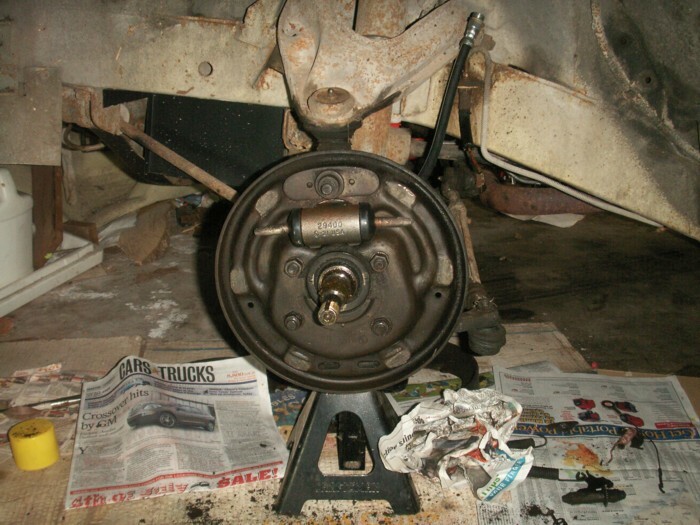 I found that the bolts holding the wheel cylinder to the brake backing plate were almost impossible to reach because of the upper part of the steering knuckle so I decided to take the backing plate off. 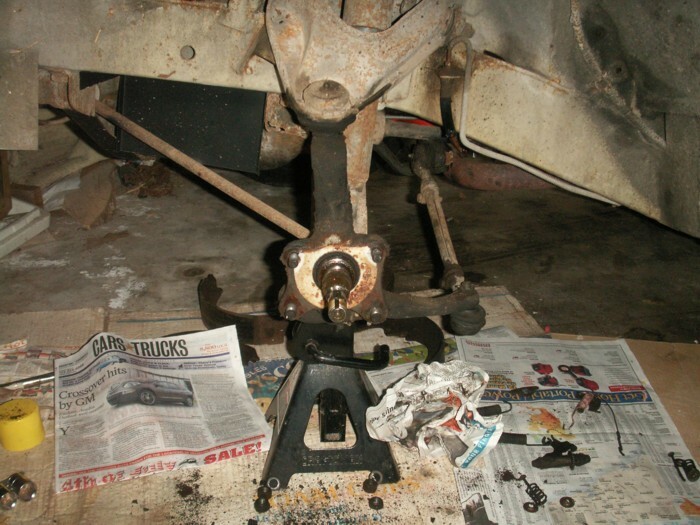 The two bottom bolts hold the steering arm/ball joint to the bottom of the steering knuckle so be sure it gets tightened securely when the backing plate is re-installed. Since I was replacing the brake hose anyway, I just cut the old one in two so I could easily plug it with a piece of my shade tree to prevent the brake fluid from leaking out. I didn't have a replacement for that white foam gasket so I just reused it. 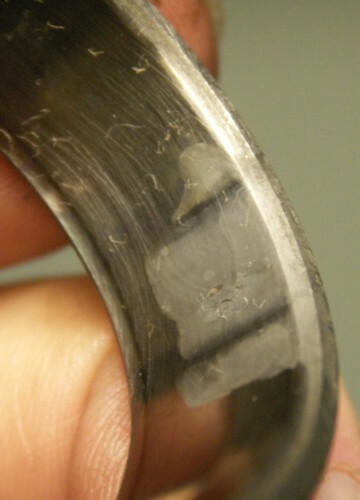 This is the backing plate after it was removed. After cleaning and installation of new cylinder and hose. This is the inside view of the backing plate. 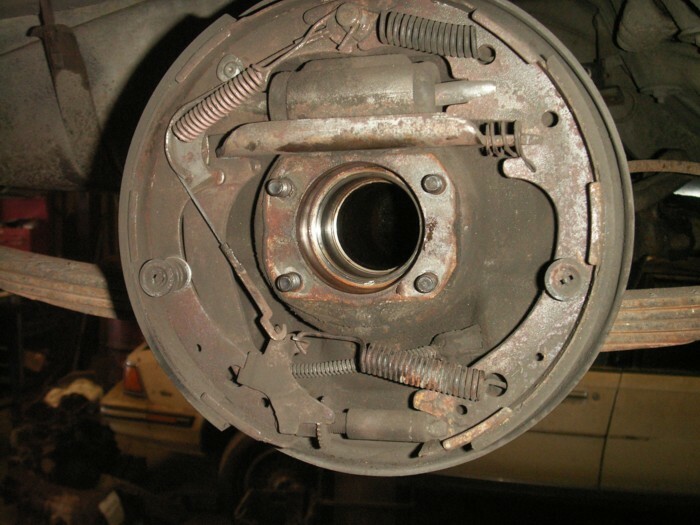 Some replacement brake parts are still made in the USA. I've seen brake parts from Italy, China, and Mexico. I still have some MOPAR wax-like lube to put on those brake shoe support pad surfaces to reduce squeaking. Here the backing plate has been re-installed. The hose isn't connected yet because I didn't want fluid to get in it before I had all the brake parts back on to hold the pistons in place. Left and right sides compared. All the brake parts are back on and the hoses have been connected. 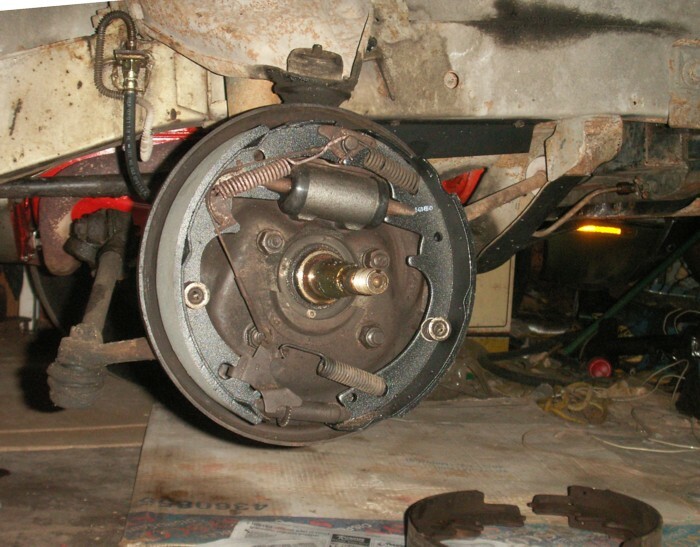 The brake shoes were painted with nice black paint that reminded me of powder coat. I haven't seen painted brake shoes before. 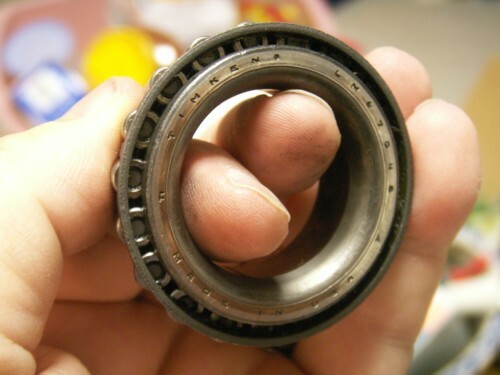 This is the inside wheel bearing. I think it's original, but I have had others work on the brakes in the distant past and they might have replaced them. I may have it recorded in an old record book. 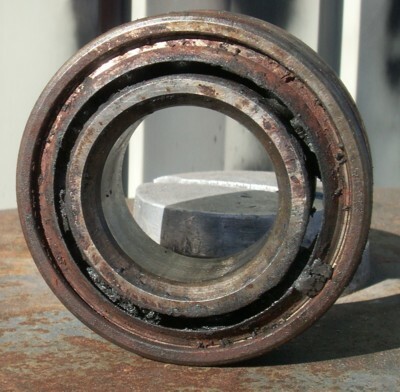 This is the outside wheel bearing. 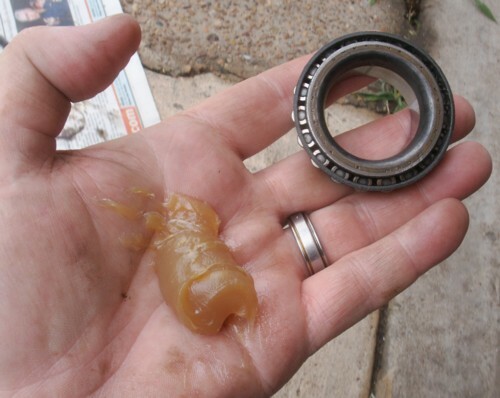 Someone told me long ago to grease a wheel bearing by first placing a gob of grease in one palm and then working the bearing into the grease while slowly rotating it against my palm. It is an effective method. 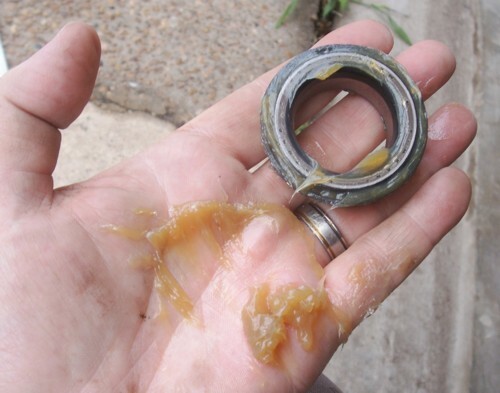 The grease disappears into the bearing and if there is an excess, it comes out the sides and can be wiped off. After I cleaned all the grease out of the right wheel hub, I noticed this dull gray area on the outer race of the inner bearing. It seemed better to replace the bearings at this point rather than try to get a few more thousand miles out of the bearings. The bearings in the left wheel seemed to be O.K. so I cleaned, greased, and reused them. The brake drum is re-installed. I painted the front drums with Rustoleum damp-proof primer long ago. Keeping the car inside a garage on a concrete floor with a vapor barrier also helps to preserve them. That isn't the original cotter key, but it's the one that was on it twenty years ago. The wheel studs have left-hand threads and they are marked with an "L" although it doesn't show up well in this photo. I was still shooting film when I re-installed the overhauled engine and transmission and started checking the brakes. 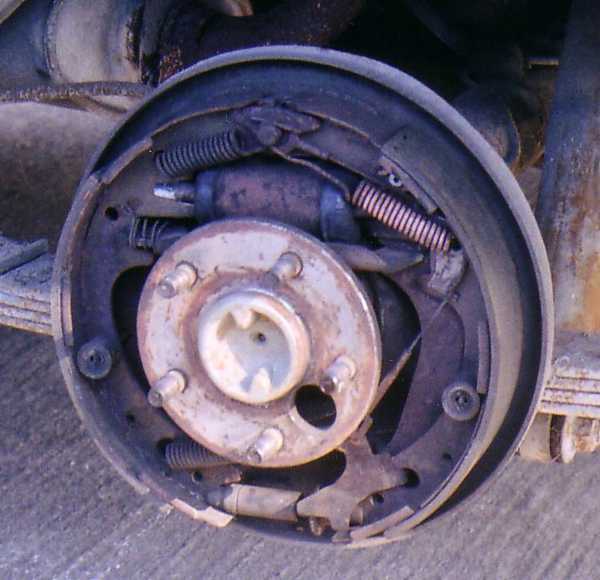 This image is scanned from the center of a color print and shows the left rear axle and brakes with the drum removed. Later I replaced the wheel cylinder. I took the shoe return springs loose, took the brake line loose, unbolted the old cylinder, and worked it out without having to remove any other parts. This is the right side as photographed in a shop in Grants, New Mexico. I KNEW I could hear a bearing going bad, but "NO" the local mechanic said that he couldn't hear anything unusual. 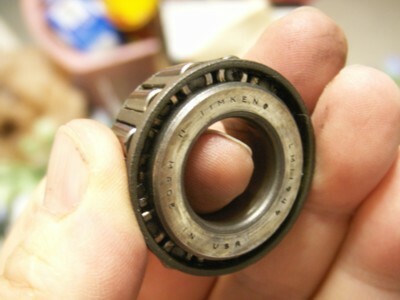 Eighteen miles past Grants, we knew that the bearing was really bad, but we were able to make it back. I had the bearing and seal with me. I had bought them to replace at home. The mechanic in Grants was able to replace the bearing and seal in an hour and we were back on our way. 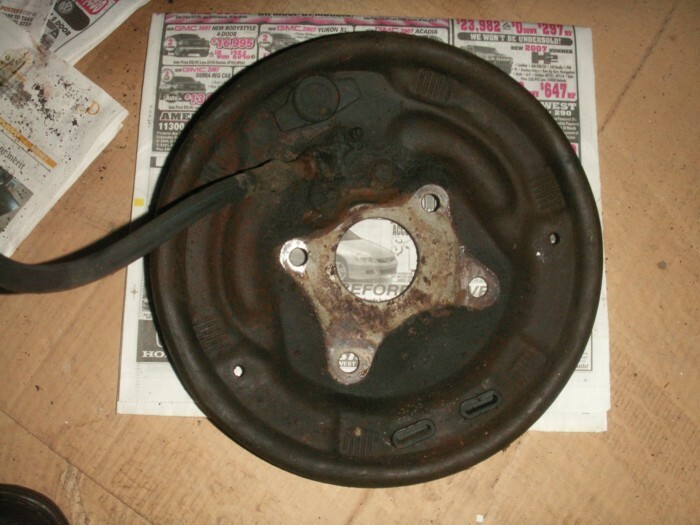 The brake shoes in the photo were installed before the car was parked more than 20 years ago. They still looked good to me so I didn't replace them when I reworked the brake system. The hydraulic cylinders are new. The other parts and drums are original. The outer axle bearing is a permanently sealed ball bearing. Well, actually, permanently is just so long. It isn't really forever. You should replace the rubber brake hoses more often than I do. The rear brake hose was totally blocked. I don't know if it was plugged before I stopped driving the car 20 years ago, but I think I would have noticed it. Anyway, it was the original hose. This is the new hose, of course. PAGE TWO - Page two has more detailed photos of the exterior and interior of the car. The pinstripes are shown and the dash and instrument panel. Front bucket seats and folding back seat and trunk panel. Photos of grille sections and taillight. PAGE THREE - This pages has photos of the engine rebuilding work in progress at Cookie's Auto Machine Shop. It shows the bare short block, piston installation, and Cookie at work. PAGE FOUR - Page four has 14 images showing the completed engine after it was painted and then after the exhaust manifolds, pulleys, fan, brackets, distributor, coil, and such had been re-installed. It seemed to be easier to install all those things before putting the engine in the car. My only concern is fitting the left manifold around the steering column while dropping the engine in. PAGE FIVE - Page five has photos and comments of the engine re-installation. I demonstrate that I can carry the transmission (without the torque converter). There are a couple of photos of the clean engine compartment before the engine was installed and then a couple more of the engine after it was installed. I photographed the antifreeze warning and battery charge warning decals on the radiator support panel. PAGE SIX - Page six has a photo of the Barracuda parked out in the driveway on the first day of spring 2004 and closeups of the carburetor as it is installed and the engine compartment with the engine in running configuration. It has been driven about 15 miles since the overhaul. 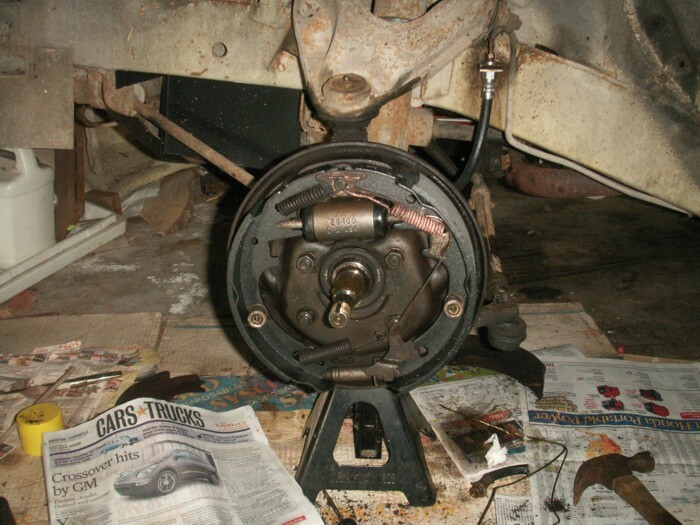 There is a photo of the bottom of the car and of the left rear axle and brake parts with the wheel and brake drum removed. 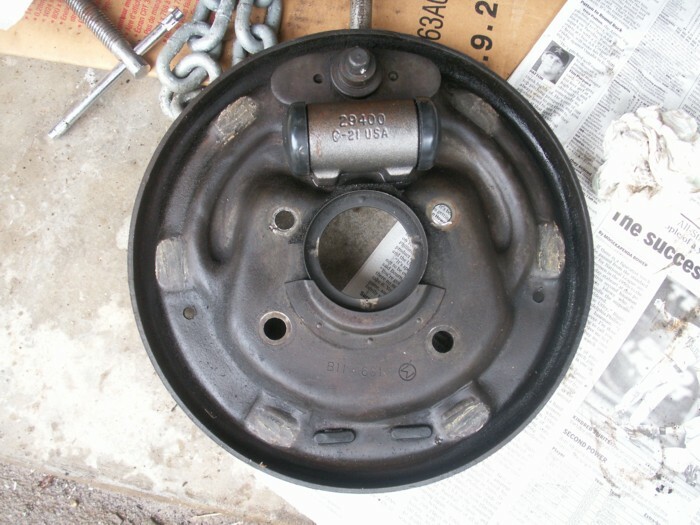 BRAKES - Photos of complete rebuild of front drum brakes including removal of backing plate and regreasing bearings. 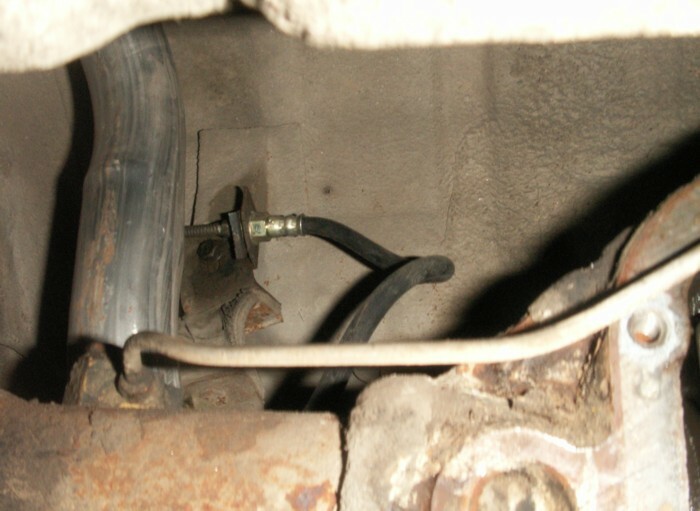 Photos of back brakes and bearing plus back brake hose. Alternator Wiring - Photos showing every connection from battery to alternator power output terminal and wiring through the voltage regulator to the field connection on the alternator. The wire I.D. numbers for the shop are given along with wire gauge and wire insulation color. Instrument Panel Removal and Disassembly - This page shows photos of the instrument panel partially removed from the dash and the various connections that are made there. It also has detailed photos of the instruments and the printed circuit boards on the back and details of the speedometer mechanism. A-Body Gas Cap Replacement - Photos of combining an old replacement cap and a new Stant 11811 cap to make a usable replacement for the original. Original 66 Barracuda Radiator Photos - Photos of my original radiator. 1966 Barracuda Owners Manual - Selected pages from my owners manual. Barracuda History - This site provides an excellent brief history and description of the early Barracudas. ULTRAJOSH - This site is an excellent resource for everyone who is working with the early Mopars. In addition to photos and details of his work on a '66 Barracuda there are links to sources of hard to find parts and instructions for all sorts of electrical work as well as mechanical. Check out this site. It may have just what you need to solve a Mopar problem! I found a source for an electronic voltage regulator that is built into a mechanical regulator case which accepts the original wiring connections!